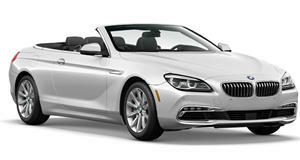 Special-edition convertible revealed along with updates to the entire 6 Series line-up. BMW has announced a special edition 6 Series Convertible for the US, while revealing minor updates to the rest of the 6 Series as well. Limited to 100 units, the 2014 BMW 6 Series Convertible Frozen Brilliant White Edition is named after its matte white paint job and comes with Frozen Black wing mirror caps, black grille, and 20-inch two-tone Ferric Grey/gloss-tuned BMW M Performance alloys. It's also equipped with Black Nappa leather seats, Grey Poplar wood trim, and the M Sport and Executive packs. Available as a rear-wheel drive 650i or all-wheel drive 650i XDrive, the special edition Convertible is priced at $106,695 and $110,095 respectively, and will hit dealerships in May. BMW’s specific updates to the M6 include an optional 6-speed manual and M Carbon Ceramic brakes, while the Bavarian carmaker also announced that all 6 Series Gran Coupe models will now be available with xDrive all-wheel drive. The only other news of note is an upgraded iDrive system boasting revised graphics, 3D elements, interactive map, and split-screen display.